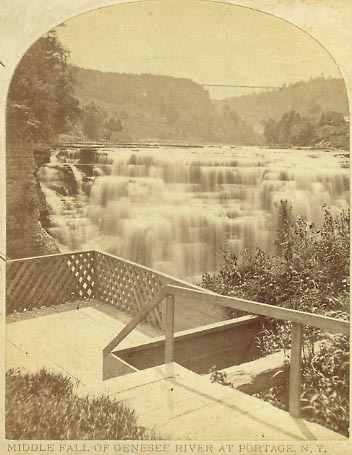 "Middle Fall of Genesee River at Portage, N.Y."
"Artistic Gems of American Scenery"
A peaceful summer scene is captured near an overlook Mr. Letchworth had built on the west bank of the gorge north. The veil like waters of the Fall fill much of the photo, though you can see the Portage Bridge and a hint of the Upper Falls in the distance. Tourists can still see a similar view of the Falls from the modern stone overlook.